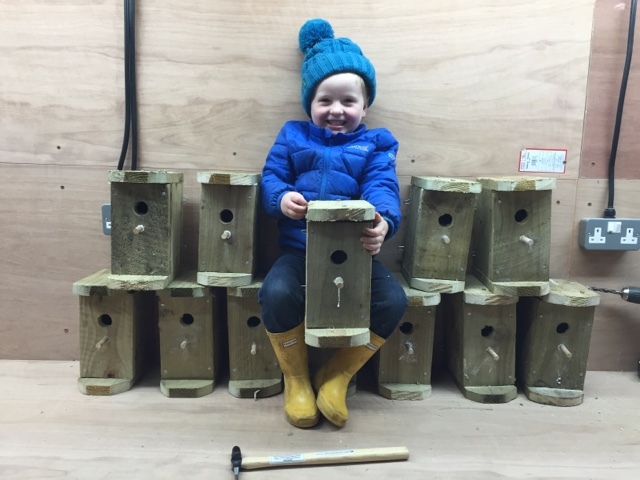 It really is a family affair at TOFT and not just for those of us who work here on a regular basis. THis weekend we had the pleasure of our daughter Laura (aka FEMME) taking a break in her busy recording schedule to sample the 'vibe' on the TOFT Alpaca Open day. It's great to see that she hasn't lost her touch with the alpacas having been living that there 'London' life for the past few years. Here she is enjoying a little family fun with the Supergrans- Gran Gran Adam, Gran Shirley and Gran Sandra. That's a whole lot of Grans on the Manor in one day but fun was had by all. The two scallywags are Edward Lord and Jacob McDowell who revelled in the attention, being surrounded by Grans all day long. 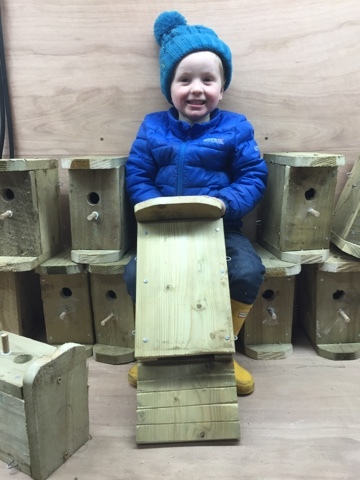 The TOFT Easter Open day took place yesterday. The Manor was running with Yarnies and fans of TOFT Studio TOFT Alpaca Stud and the TOFT Coffee Shop. The people started arriving at 9.30am even though we didn't officially start until 10am. By 3.30pm 6-700 people had been through the gates around the farm and back again. 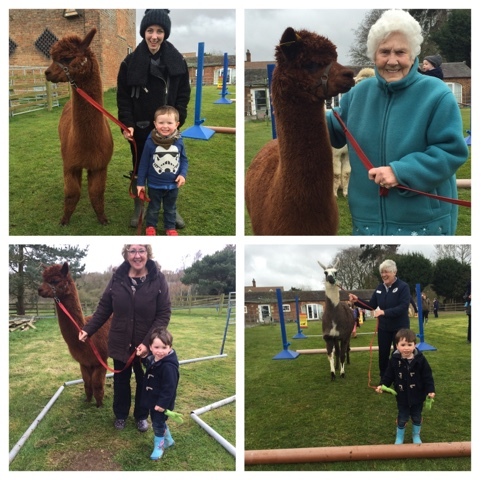 A huge TOFT thanks to all our helpers and staff who created a wonderful atmosphere in the shop, on the farm and with the alpaca walking. Happy Easter one and all and a huge thanks to our 'rellies' the TILLEY clan for giving up the time to steward and help the proceeding run smoothly. 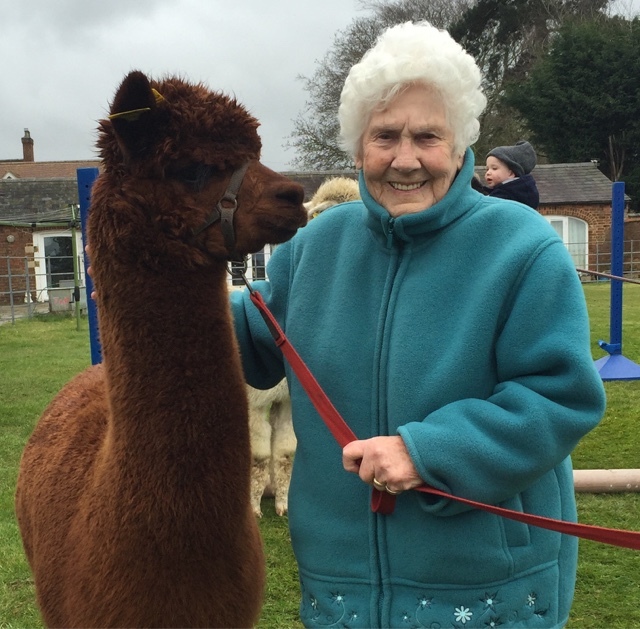 Here is my incredible Mother in Law Myra joint in in the Alpaca walking. She's a real TOFT treasure and the best a man can get. Thanks again one and all and we look forward to seeing you all again in August. Well it looks as if our breeding for colour move with the TOFT Suris might be getting results. Not sure about the character in grey in the top corner. The sooner he goes a petting the better we shall look. 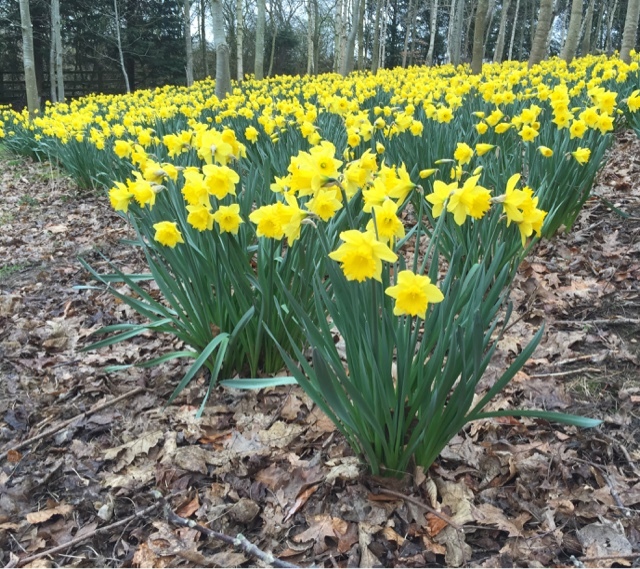 Winters grip remains on the fields and runways but Spring is sprung in the copse with the Daffodils breaking out all over at TOFT. TOFT Coffee SHop Customers have only another 6 weeks or so to wait before the Cria will start arriving for 2016. Haircut today for TOFT Toledo. He is one of the last Cria to be weaned and we are waiting for him to start eating hard food before we take him away from Mum. Having observed him closely we realise that he is eating hard food when it is in front of his nose or we hand feed him but he doesn't seem to be aware of the food in the trough. We think this is because he can't actually see it. 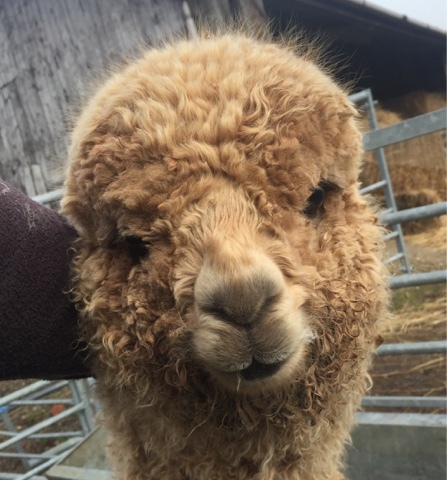 Some of these elite superfine Cria get a little fleece blind as they are carrying a fantastic amount of fleece on their face in the first year. This tends to even out and clear the eyes as the alpaca matures but the weaners often need a touch of the Vidal Sassoons around about now. Today I obliged on TOFT Toledo and he will be a happy boy tomorrow once he acclimatises to the fact ther is a whole world going by around him. 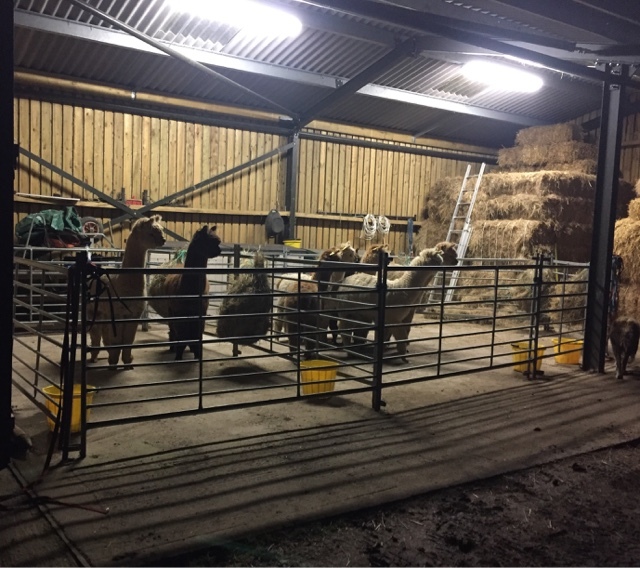 TOFT show team were brought out of the shed by Freya this morning, early doors, for an airing outside for a couple of hours before journeying to the International Centre Telford for the British Alpaca Society National Show 2016. 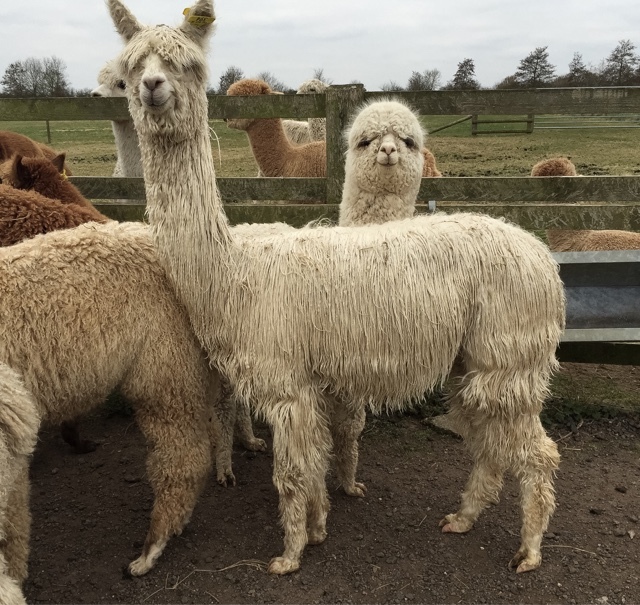 It is virtually impossible to judge alpacas when they are wet so we shed them up to keep them dry as a bone for a few days before the Nationals. At the Nationals we have fans blowing over them whilst they are in the pens to stop them 'sweating up'. This gives our show team the best chance they've got of competing for the medals the rest is up to them! Here's hoping? The show kicks off at the International Centre Telford tomorrow at the crack of sparrow fart and ends around 4pm on Sunday. 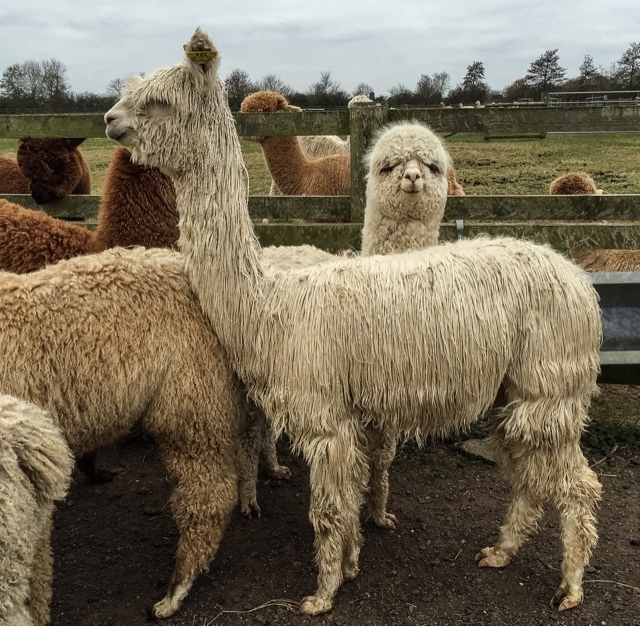 Over 500 alpacas have been entered making this the biggest show in Europe. It is open to the public if you fancy an alpaca fest. Don't forget to come and say hello to TOFT if you do. 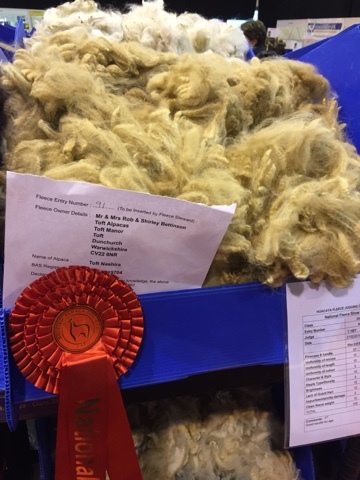 With the weather report threatening Snow and all sorts over the next couple of days we though it best to shed up the TOFT show team ready for the Nationals on Saturday. 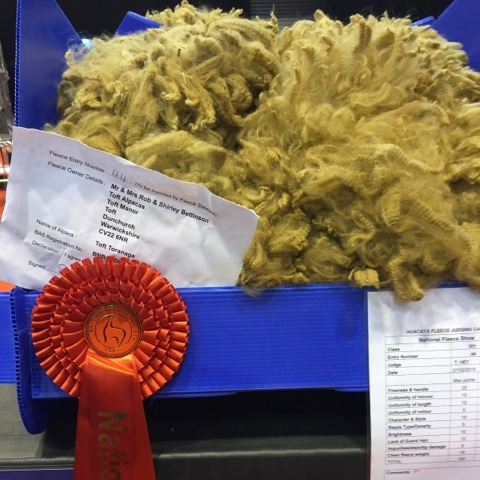 With over 500 entries at the National Show this coming weekend competition will be fierce. So we had better look our best. Alpacas don't show well in the wet. There is no lanolin in their fleece, when they get wet they get wet and dry themselves in the wind the minute the rain stops. Their fleeces have the ability to absorb over 30% of their weight in water so it's a bit like rubbing you hands over a wet dishcloth judging them when damp. Impossible. Anyway that's not a problem for TOFT we have them in the fed shed all tucked up against the elements for the next few days. 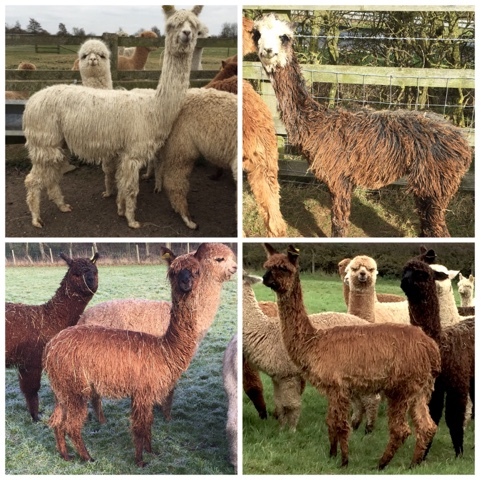 Friday they go off to the International Centre Telford for the British Alpaca Society National Show. If you fancy seeing the very best the Uk has to offer you need to be in Telford 8am -5pm Sat and Sunday this weekend. Don't forget to come and see us if you get there. 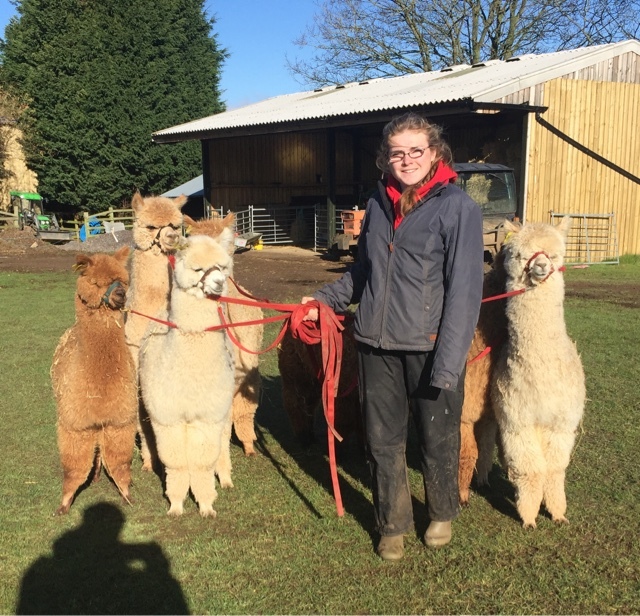 We wish the best of luck to our livery alpacas from Snapdragon and Arre alpacas who each have an entry in their weekend. 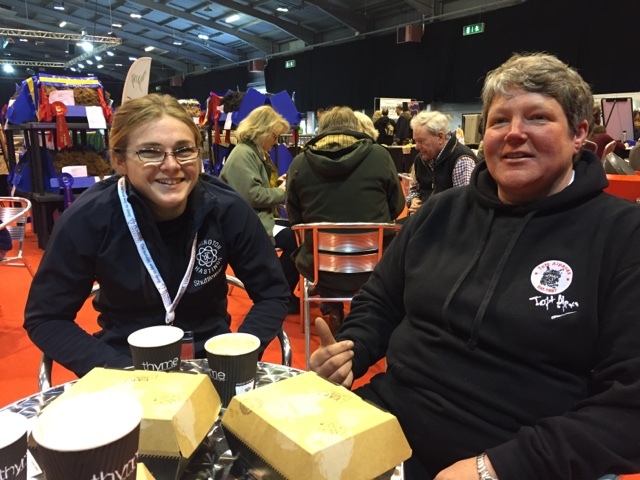 They will be travelling with the TOFT team to Telford and we hope retiring with a rosette.